On November 2, 2017, William McAllister, received the Wayne County Community Foundation’s “Founder’s Award.” The Foundation presented the award at its Ben Franklin Service Award Dinner. Foundation Board President, Warren Schloesser, praised Mr. McAllister’s dedication to the organization explaining to the audience that he was one of the first five members of the Board starting in 1991. He continued to serve on the Board for 25 consecutive years. Currently, he is a member of the Foundation’s Investment and Finance Committee and most recently was the Chairman of the very successful, “Bring Ben to Town” project. Can you imagine having the opportunity to manage and to bestow money left by one of our country’s Founding Fathers? In 1790, Ben Franklin, printer, scientist, philosopher, community servant and statesman, created a legacy that today reaches right into our own community! The Ben Franklin Fund represents one of the finest examples of what philanthropy is all about. The Fund shows how money set aside from a donor can impact the future. In Ben Franklin’s case it took two hundred years to bear the financial fruit he envisioned. In his will, Franklin bequeathed 1,000 pounds sterling, roughly equal to $4,000, to the Commonwealth of Pa.. Franklin knew his bequest would grow over time, so he stipulated that this amount be invested for 200 years and at the end of that time it had grown to over $2 million dollars. In 1990, then Pennsylvania Governor, Robert P. Casey, signed a bill dividing the money between the Franklin Institute in Philadelphia and the State’s various community foundations. 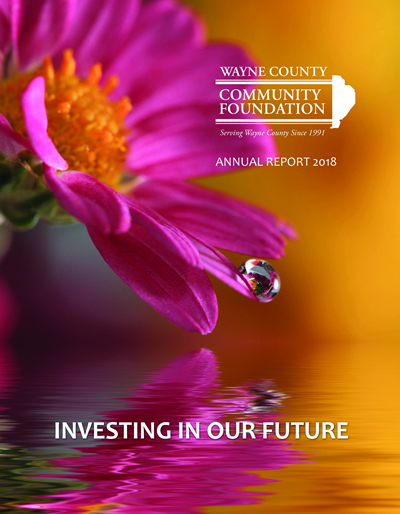 Indeed, the Wayne County Community Foundation was in the right place at the right time sharing in the distribution of the fund. The Foundation has thereby established the Ben Franklin Community Service Award with its accompanying $1000 given to the recipient who then presents it to the local service organization of his or her choice. The 2008 winners was Attorney Warren Schloesser and he awarded his grant to the Wayne County Community Foundation’s “Educational Excellence Endowment”.